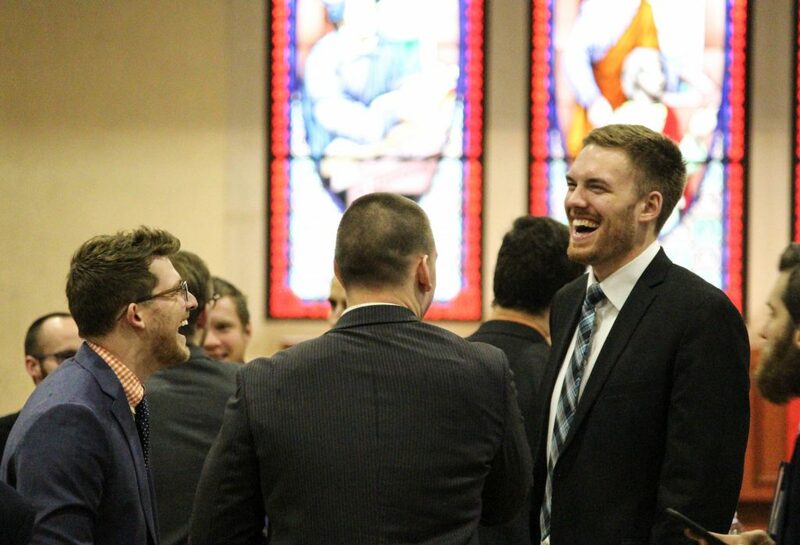 From February 5-7, students at Wisconsin Lutheran Seminary participated in Mission & Ministry, an annual three-day event organized by the students. Each day featured a worship service, keynote address, and an update from WELS administration. In addition, to give these future pastors a cross-section of experiences they may face in ministry, twenty-four breakout sessions were offered in specific topics. These sessions included discussions on personal evangelism, cultivating a caring congregation, urban ministry, planting churches in rural areas, 125 years of ministry to the Apaches, and mission opportunities in Africa, Latin America, and Vietnam. Also, to see what synodical resources are available to congregations, WELS organizations set up displays to share information about their work in God’s kingdom. On Tuesday, Mission & Ministry focused on WELS Congregational Services. Rev. Jon Hein shared the work of Congregational Services through its six areas—Discipleship, Congregational Counseling, Evangelism, Lutheran Schools, Special Ministries, Worship. All exist to offer assistance to congregations and schools so they can carry out their ministries faithfully and efficiently. The day began with an opening worship service, which was followed by a keynote from Rev. Eric Roecker, the director of WELS Evangelism. Tuesday’s breakout sessions covered topics from graphic design for worship and outreach to prison ministry. Other session covered relationships for school outreach, welcoming guests, personal evangelism, loving the straying, cultivating a caring congregation, and congregational life cycle. On Wednesday, Mission & Ministry focused on Home Missions. After an opening devotion, Pastor Keith Free, administrator for home missions, gave an update on the broad scope of home mission work taking place. Then keynote speaker Lucas Bitter spoke on his work at Intown Lutheran, a new mission church in Atlanta that launched full-time worship this fall. Wednesday’s breakout sessions covered topics from urban ministry to reaching out during a natural disaster. Other sessions discussed campus ministry, first year dos and don’ts, ministering to your mission field, and planting churches in rural areas. On Thursday, Feb. 6, Mission & Ministry focused on World Missions. Pastor Larry M. Schlomer, world missions administrator, discussed the ways God is blessing the gospel work being done in many countries and languages and keynote speaker Gary Lupe spoke on 125 years of mission work to the Apaches. Thursday’s breakout sessions covered what it’s like to coordinate mission work to 45 missionaries around the world and 125 home mission congregations in 35 states. They also heard updates about mission opportunities in locations such as Africa, Latin America, Vietnam, the Asia-Pacific Rim, as well as to South Asians in United States. Seminary students are not the only ones who benefit from the event. On Tuesday, the junior class of pastor track students at Martin Luther College, New Ulm, Minn., attended presentations. In all, almost 200 students, professors, and guests participated. For more photos of the event, visit the seminary’s Facebook page.